Sometimes you do not want to use all the bands from an image dataset in classification analysis. Under such circumstances, you can create a subset of bands for the classification without creating a new raster dataset. To do so, use the Make Raster Layer tool to create a new image layer with the desired band composition. Then select the new image layer on the Image Classification toolbar. On the Standard toolbar, click the Search window button to open the Search window. Type Make Raster Layer and click the Search button. The Make Raster Layer tool is displayed in the search results. Click the Make Raster Layer item in the search results to activate the Make Raster Layer tool. On the Make Raster Layer tool dialog box, choose an image layer or a dataset on the disk for the Input raster parameter. 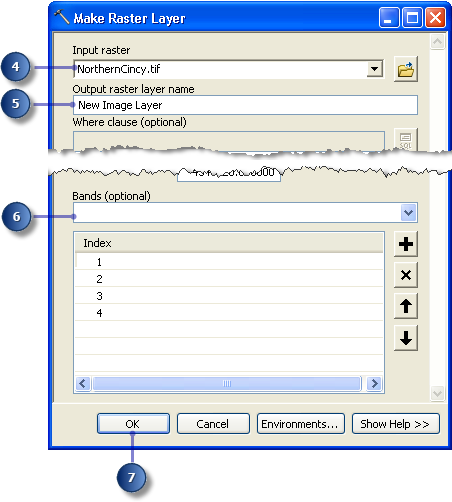 Specify a name for the new raster layer in the Output raster layer name parameter. Select the bands that you want to include in the new raster layer in the Bands parameter. A new image layer with the specified subset of bands from the original image dataset is created. On the Image Classification toolbar, click the Layer arrow and choose the new image layer that you just created. The new image layer is set as the source image of the classification analysis. Whatever bands it is made with are used in the classification analysis.